Ouch. As a dyed-in-the-wool, "everything you've heard about us is true" (at least a bit) redhead - I am guilty of having sped headlong into anger. I don't always have a quick temper, but I can and when I do it is intense. It is ugly. And the often untamed nest of red locks makes an unHoly halo that seems to accentuate the fire beneath. Words are said that sting deeply and leave a wound even when I try to retract them. My family calls it a "Cunningham" fit. Upon first reading this verse, I saw "exudes" folly rather than "exalts" folly - a lack of understanding or sense. But the NASB actually says EXALTS. To praise, honor, elevate. I praise, honor, and elevate foolishness?!?! Not only am I displaying a lack of comprehension, intelligence, and compassion - I'm putting it on a pedestal and praising it. As if it were something to be proud of. How very Irish of me. 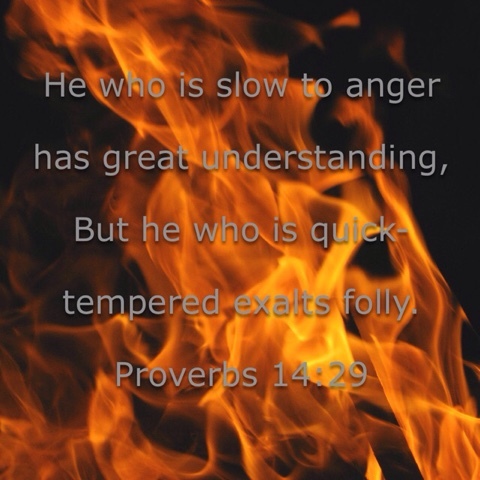 How can I slow my anger? I want to glorify God, not foolishness. I want to practice wisdom and empathy. None of the passages of the Bible I found on anger set the expectation of never being angry, but there are instructions on how to be angry. for the anger of man does not achieve the righteousness of God." Can one find themselves being quick to be angry if they are focused on listening ... on really hearing instead of on speaking, on what they will say next? But quick-tempered individuals like myself aren't often slow to speak. Most of us are in a blustering hurry to be heard, have our thoughts and feelings known. By being a better listener I won't be in a near-constant state of anxiety, always waiting for my turn to speak. Afraid that I might forget that brilliant thing I thought of to say. Instead I can listen, really listen, and try to understand what the other person has to say. Getting the whole story, the intentions behind the actions, can diffuse the tension, and our new-found listening skills can build trust instead of tearing it down. Dismantle walls instead of reenforcing them. I'm willing to bet we will find those close to us become quicker to share things and we will feel less wronged by things that were hidden until they reach a boiling point when we stop boiling over. and abusive speech from your mouth." We are called to die to these things ...put them to death again and again when our old nature tries to rise back up. We must die to ourselves ... not suicide, but we need to find a productive way to slaughter our sin nature. For me taking a walk and reconnecting with God slays the beast, takes the fire out of my sails. For you it may be something else, it is very personal and as unique as each of us is. One way or another we need to suit up in the armor of God and kill the dragon. and do not give the devil an opportunity." We must choke our angry outbursts without then stewing in them. We aren't to rest until we've stilled our hearts and let go of the anger. Hanging onto it gives Satan a stronghold which can put a stranglehold on our effectiveness for God. And in the case of this redhead, it just becomes a ticking time-bomb anyway. It may not have exploded, yet ... but if I don't let it go ... the smoke has not yet cleared. Lord, keep me from this foolish practice. Let me be slow to anger and quick to let it go.